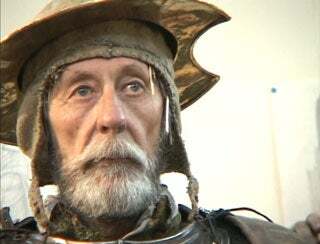 According to ComingSoon.net, Terry Gilliam has announced that his next film may be The Man Who Killed Don Quixote. If you're not aware of this film, you should be. "I'm going to try to do 'Don Quixote' again," Gilliam responded when asked about what he's working on now. "I think this is the seventh time. Lucky seven, maybe. We'll see if it happens. " Filming on Don Quixote has actually begun once before, way back in the year 2000. The film was to originally star Jean Rochefort as Don Quixote and Johnny Depp as Toby Grisoni, a man from our time sent back to 17th century Spain. Once filming began, Gilliam and his crew were beset upon by setback after setback including picking a location in Spain near a NATO aircraft range and an injury to Rochefort. The setbacks eventually caused the cancellation of the film. The entire ordeal was made into the excellent documentary Lost in La Mancha. The Man Who Killed Don Quixote has probably always haunted Gilliam and finishing the movie, for better or worse, would most likely be cathartic for him. "This is kind of my default position, going back to that. I actually just want to make it and get rid of it. Get it out of my life." We should all be rooting for Gilliam to get this monkey off his back for one reason; another film that Gilliam has had in development for years is Good Omens, based on the book by Terry Pratchett and Neil Gaiman. If The Man Who Killed Don Quixote can be made, there is hope that we will finally see the onscreen adventures of Anathema Device and Newton Pulsifer.